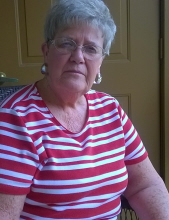 Patsy Lee Self, 78 of Vidor died Saturday, April 7, 2019 at her residence. She was a native of Vidor, TX and lived in Greenville, TX for 34 years before moving back to Vidor just a short time ago. Patsy was a member of Turning Point Church in Vidor and was a homemaker. She enjoyed scrapbooking and sewing. Cremation arrangements were entrusted to Memorial Funeral Home of Vidor. A memorial service will begin at 10:00 am Thursday, April 11, 2019 at Turning Point Church. Patsy is survived by her husband of 59 years Varesse L. Self of Vidor, TX, daughter Vicki Crile of Vidor, TX, son Jay Self of Nevda, TX, sister Betty Watson of Merritt, TX and brother Donald Bearfiled of Abilene, TX, 4 grandchildren and 5 great grandchildren. To send flowers or a remembrance gift to the family of Patsy Lee Self, please visit our Tribute Store. "Email Address" would like to share the life celebration of Patsy Lee Self. Click on the "link" to go to share a favorite memory or leave a condolence message for the family.